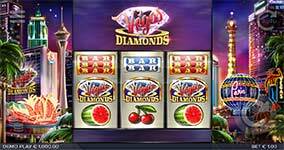 The excitement of Sin City comes alive with winning possibilities in the new Vegas Diamonds online slot by Elk Studios! Take a walk down the Golden Mile and discover the draw of Las Vegas in this exciting new 3-reel classic slot that features a rewarding triple wheel bonus game. You can earn extra rewards with bonus features like Multiplier Wilds, Perfect Match Re-Spins and Vegas Diamonds Nudges. Multiplier Wild Symbols – The wild symbols include a multiplier of 2, 3, 4 or 5. They substitute for any symbol except the fortune wheel, other wild symbols and the nudge feature of the diamond symbol. Perfect Match Re-Spins – Identical symbols on reel 1 and 2 make these two reels lock into position for 3 re-spins while the third reel spins normally. The locking of the identical symbols significantly increases the player’s chances to win. Vegas Diamonds Nudge – The Vegas Diamonds symbol is the most valuable symbol in the game, the three Vegas Diamond symbols anywhere in view make the reels nudge to get all the three valuable diamonds aligned on the middle row. A really lucky hit with diamonds in the Perfect Match Re-spins might re-trigger the nudge feature three times. The Vegas Diamonds Fortune Wheel – Three bonus symbols trigger the Vegas Diamonds Fortune Wheel with 3 guaranteed rewarding spins. Lucky hits take the player from the Bronze to the Silver and then potentially all the way to the impressive Golden Wheel. The size of the potential wins ranges from 100 times the bet on the Bronze Wheel up to the breathtaking 1000 times the bet on the Golden Wheel.